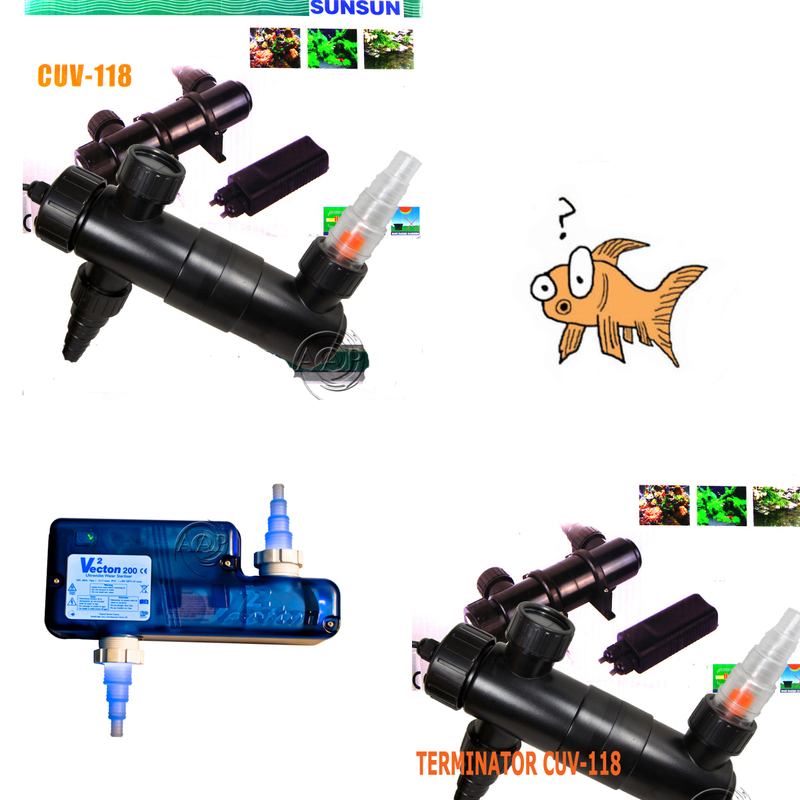 Aquarium and Pond UV Sterilizer, Clarifier Reviews; ProblemsAquarium and Pond UV Sterilizer, Clarifier Reviews; ProblemsAquarium and Pond UV Sterilizer, Clarifier Reviews; ProblemsAquarium and Pond UV Sterilizer, Clarifier Reviews; Problems . The Aquarium UV Sterilizer market has now been mostly taken over by Category C UV Sterilizers which are not capable of level one or two sterilization unlike 'Category B' or especially 'Category C' units. While these cheap UV clarifiers masquerading as true UV Sterilizers have been around for some time, misguided Obama era regulation outlawing high output magnetic ballasts in 2014, has made just obtaining a UV clarifier that can fire the High Output UV lamps capable of running a 'Category B' or especially 'Category A' UV Sterilizer difficult to find if at all in some size UV Sterilizers. 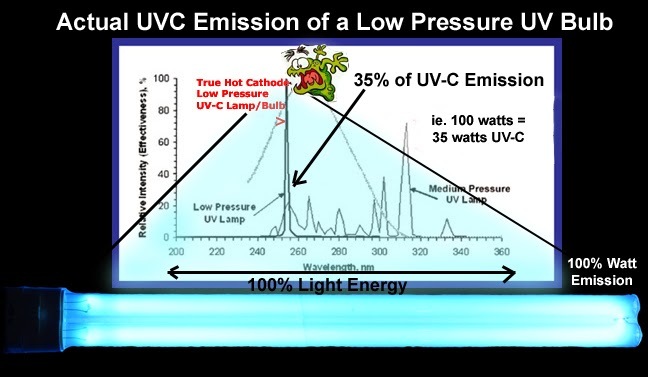 High output UV lamps/bulbs have 35% UVC versus common low output UV lamps which have about 7-10% UVC. This is FOUR TIMES the UVC output!! These same HO UV lamps require a surge voltage to start that is often 500+ volts which most modern cheap electronic ballast simply cannot do or at least for more than a couple of starts. The reason for this law was for efficiency of fluorescent lights, which is fine for your average hardware store fluorescent light fixture, but NOT for a high output UV Sterilizer. This law opened the door for even more cheap Chinese UV Clarifiers masquerading as true UV Sterilizer to flood the market. It also takes some education to understand this, but one does not need be a rocket scientist either. One confusing aspect for consumers is they will see the same model number such as CUV-118 and assume that two models at very different prices are one in the same, WHEN IN FACT THEY ARE NOT! When a retailer orders something from China, it can be ordered to certain specifications at a different price (think Apple with the iPhone as these have been manufactured in China, but to standards set forward by Apple). 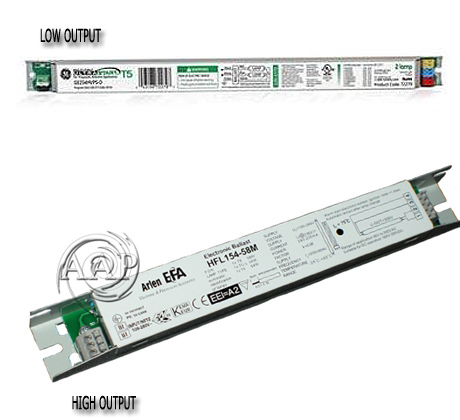 When one considers the wide price of ballasts and HO UV lights versus low output UV lights, price alone is an easy indicator. You cannot sell an 18 Watt UV Sterilizer with "free shipping" (which requires the seller to pay shipping) and pay eBay fees of 10%+ for $60 when the actual cost of a true Category B CUV-118 Terminator UV is well above $60 and stay in business. So obviously these sellers (such as one eBay seller in China operating out of a home Hacienda Heights, CA.) are selling UVs with standard ballasts/power supplies and low output UV lamps, so all you are getting is a Category C UV Clarifier. Let's take a look at a 55 Watt Ballast/Power Supply. A "GE UltraStart GE254MVPS-A (67562) T5HO Programmed Start Ballast" is selling online $19.40. While a "TMC 55- 58 Watt High Output Electronic Ballast" sells for $75.99. One might argue that the $75.99 ballast could be cheaper, however one cannot reduce the price by almost 75% and be profitable. Now back to your UV Clarifier you see listed on eBay of Amazon for $60, it becomes quite obvious that this is simply NOT possible to have a True Category A or B UV Sterilizer at this price. Yet so many fall for this. This in turn creates another problem which is fed by social media and Google with its current search no longer considers content & authority, rather popularity in social media. People will purchase these cheap 'Category C' UV Clarifiers then report back to social media that they did nothing for disease prevention nor little for Redox balance improvement and often are not all that good for clarification. This will be accepted as science based fact when in fact it is not and next thing you know you have people stating UV Sterilizers are mostly useless despite real evidence to the contrary. AVAILABILITY OF HO UV STERILIZERS. With this law, many ultra premium Category A UV Sterilizers have unfortunately been permanently retired. However some of these premium Category A UVs have had electronic ballasts sourced that will work or in one case a European model (not subject to the law) has been used instead, although it requires being supplied with a 220V to 110V converter. As per Category B UVs, these are still generally available in most cases (although the before mentioned 18 Watt version is currently unavailable). *AquaRay LED Lighting; From the ONLY true professional online seller! Beware of a parasite retailer selling this product out of a home that does not really know this product. *Wonder Shell for Improved Aquarium Redox Balance Another tool besides a category A or B UV Sterilizer to improve aquarium redox balance and thus improve over all fish health. A great point was brought up in one of our blogs specify geared to sterilizers and UV bulbs. All the time, we hear about the wattage a bulb of any kind uses. A standard light we use in our homes are 60 watt bulbs. In water sterilizers, the bulb might be a 30 watt bulb. The point made and the question now being; does a 30 watt UV-C bulb emit 30 watts of useful sterilizing watts? And, the answer is No. The UV-C wattage emitted is not the same wattage of a lamp. Wattage of a bulb can be misleading. Watts used in a bulb is the power consumption of a bulb. A 60 watt bulb used 60 watts of power. The actual output of a bulb is directly related to the wattage. The higher the watts used, the great the power consumption. But what is noteworthy, is that the wattage though does not actually tell us how much useful output the bulb has, or how efficient it is. The efficiency of the bulb is the actual output of the bulb. This efficiency is what becomes important as we look for a replacement for our UV Sterilizer/Clarifier or even a new UV Sterilizer as most of what is sold via the Internet or discounter brick & mortar stores are LOW OUTPUT medium pressure UV bulbs/lamps with as little as 25% of the UVC of the vastly better low pressure high output UV lamps sold but by a handful of high end sellers. So please read on and beware if the price seems too good. Specify speaking about UV-C bulbs, they have a light energy spike at a certain wavelength of light (254nm). This light energy is what sterilizes. With any UV-C bulb, there will be an energy spike at this lighting level as well use some of it lighting energy on other parts of the lighting spectrum. The light emitted at the UV-C namometer of light is the useful energy or wattage used from the bulb. The other energy emitted on the lighting spectrum that is not UV-C is essentially wasted energy. Therefore the wattage of the lamp is not the same wattage being emitted of UV-C.
A 30 watt UV bulb does not emit 30 watts of UV-C.
Take a look at this picture which shows the energy spike of a UV bulb. At this spike, light energy has sterilizing abilities. In a premium low pressure true UV bulb, the actual UV-C emission of the bulb is about 35%. If you have a 30 watt UV bulb, it will emit 10.5 watts of germicidal UV-C.
Nail curing UV Bulbs, are commonly sold on Amazon & eBay for aquarium pond use at a lower cost (generally for retails prices of $5 to $15). These are usually medium pressure UV bulb with a low 7-10% output of useful UV-C irradiation. These lamps have a wholesale cost of only a few $ for the smallest ones. As well the Halogen UV bulbs sold in some mini UV Sterilizers also have little of the peak UVC irradiation, more in the UVB range (these too are sold at discounters such as Amazon, not quality professional UV Sterilizer sellers). A good example of a UV Clarifier sold with these UV lamps is the Cobalt Aquatics Micro-UV which besides using the lower output Halogen UV lamp/bulb, it has very poor dwell time. Both of these types of these low cost UV bulbs are marginal for clarification at best, certainly NOT level one or higher UV Sterilization unless used at very high wattages per water flow!! When combined with the lower dwell time that most of these Sterilizers that utilize these medium pressure lamps have (generally compact UVs), you are looking 1/4 the killing/sterilization/clarification power!! An example would be comparing a TMC Vecton 15 Watt to a Jebaeo 55 watt that is commonly supplied with medium pressure UV lamps/bulbs (15 x 4 = 60). As an example, if you have a 9 Watt UV Sterilizer (such as the Turbo Twist), and when the bulb is due for replacement you utilize one of the low cost medium pressure UV Bulbs, you will be getting 1/4 to 1/3 the output of a premium low pressure bulb. 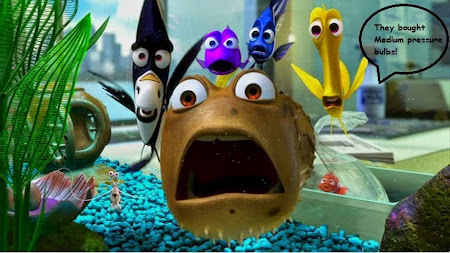 So if you have a flow rate of 200 gallons per hour on your say 50 gallon aquarium as would be a flow rate for low pressure UV Bulb, then switch to the low cost medium pressure UV Bulb, you would need a flow rate of 80 gph just to maintain Level One UV Sterilization. The bottom line is to not be tempted by the low prices of the nail curing medium pressure UV Bulbs that many retailers either unknowingly or knowingly incorrectly market for pond or aquarium UV Sterilizer use! Normally, the actual emission of a UV bulb is something you will not need to worry about, but what you do what to make sure is you are getting a large enough sterilizer for the water quantity you are looking to sterilization. Company’s that know what they are talking about will publish this information or keep it in mind, when giving recommendation. If you are not sure, make sure to look for what kind of bulb/lamp the sterilizer has and how much UV-C you are actually getting. I have already published articles/reviews earlier with the 9 Watt UV Bulbs and 13 Watt UV Bulbs commonly sold as replacements; either as not true hot cathode/low pressure lamps in the case of many 9 Watt lamps or with the incorrect base for many applications as in the 13 watt GX23 versus the 13 Watt G23. In this review/article I will now look at another common UV Bulb that like the 9 watt in particular is often not what it seems; the 18 Watt G11 UV Replacement Bulb!! In a market driven by price and "free shipping" the only way to deliver a so-called UV bulb at the prices offered is to sell the "medium pressure UV Bulb" as an implied "Hot Cathode, Low Pressure UV-C Bulb/Lamp", which NONE sold at prices much under $15 can be (especially when shipping is calculated in). The cold hard facts are, NO business can exist selling a TRUE hot cathode, low pressure UV-C Bulb that has a cost of $13 OR MORE (out the door to the vendor) for this same price with shipping included!! Even at a retail price of $16- $20, a business would have to operate at a very low overhead and profit margin. As well, although often difficult to find, the some 18 Watt G11 UV Replacement Bulbs use patented methods to lower operating temperature which increases the efficiency and UVC output. Norman lamps super high efficiency HO/low heat UV Bulbs. Lower operating temperatures which in turn increases energy directed as UVC (which is why you have a UV light in the first place). This 5° C difference increases efficiency about 5% or more, adding to the 75% improvement of these low pressure UV lamps over common lower cost medium pressure UV lamps/bulbs sold at online discounters and home improvement warehouses. Longer Life and higher output over the life of the lamp. Easier starts, which new hot cathode UV lamps are often difficult to start initially. 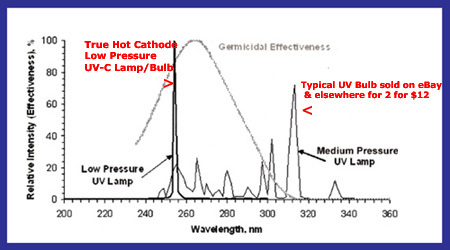 Simply put; these commonly sold, medium pressure bulbs at 7% germicidal 254nm UVC simply cannot destroy the bacteria or maintain aquatic Redox at any useful/normal flow rate when compared to the high UVC output hot cathode UV-C Replacement Lamps. This is not to say that these higher output are not easy to find, as they can be found, you simply have to be willing to pay a bit more (often with sale prices high quality UV-C Bulbs/Lamps not that much more too). Several manufacturers/distributors such as American Aquarium Products, Purely, & Phillips all sell ONLY hot cathode, low pressure, Higher Output 254 nm UV Bulbs. As the graph shows, the low pressure UV bulb has its energy spike primarily in the optimum UVC range, however the medium pressure UV light has several spikes, admittedly including some in the optimum range, which is why these bulbs can still get away with calling themselves 254 nm germicidal bulbs, when in reality only small percentage of their energy output is in this important UVC range. The bottom line is do NOT let Google, eBay, Amazon, etc. guide you to one of these many websites selling these mostly useless medium pressure UV Bulbs that produce little UVC necessary for an effective UV Sterilizer or Purifier. Spend a little more and purchase a American Aquarium, Purely, or Phillips 18 Watt Bulb, which often still only sell for $16 to $30 online. American Aquarium Products hot cathode/low pressure 18 Watt is sold near cost as a promotional item and is THE true hot cathode 18 Watt UV Bulb to purchase for both quality & price! !